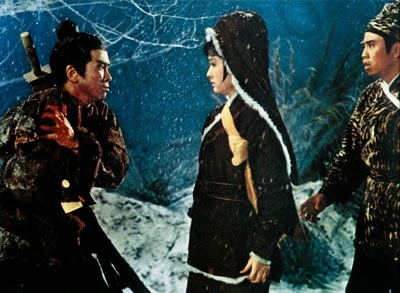 The One-Armed Swordsman was released in 1967 by Shaw Brothers and directed by Cheh Chang (Five Venoms and Golden Swallow). It stars Jimmy Wang as Fang Kang, Lisa Chiao Chiao as Xiao Man, Tien Fang as Qi Rufeng, Angela Pan as Qi Pei Er, Tang Ti as Smiling Tiger and Yeung Chi-hing as Long-armed Devil. It features classic wuxia swordplay against the backdrop of feuding sects, but also features a central love story that isn't overwhelmed by all the action (and there is a good deal of action). It seems that the wuxia films that start with very simple story lines seem to work out the best. 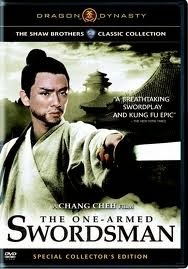 The One-Armed Swordsman is no exception, and begins with a very simple plot. It opens when the main character, Fang Kang, is still a boy. His father is a servant employed by the famous master Qi Rufeng of the Golden Sword school. Qi Rufeng attracts the enmity of some local bandits for disrupting their activities and they deliver a message to the master laden with poison, which proves enough to subdue him and force him to retreat deeper into his school grounds. Fang Kang's father, Fang Cheng, fends off the attackers while the disciples take Qi Rufeng to safety. Cheng manages to kill the attackers but is mortally wounded in the process. As a dying request he asks Qi Rufeng to take his son as a disciple, and the master agrees. Fang Kang then picks up his fathers sword, which had been broken in the middle during the fight. The film then elapses to the present, where Fang Kang is chopping wood at the insistence of the master's daughter, Qi Pei Er. Though a disciple of Rufeng, and well liked and cared for by the master, Kang is poorly regarded by his fellow disciples, and Qi Pei Er in particular seems to single him out for malicious treatment (later we learn this was her way of expressing her love for Kang). That evening Qi Rufeng reveals to his wife, his desire to retire from the martial world and make Kang his successor and marry him to his daughter. He also mentions a feud with Smiling Tiger and a master named Long-armed Devil, who Qi Rufeng once defeated, causing him to spend years seeking revenge. After a particularly bad argument with Pei Er and two other senior students, Kang decides to leave, writing a note to his master and setting out so his presence will no longer create problems for the school. As he is leaving through the woods, Pei Er and the two senior students stop Kang and demand he stay at the school. A fight ensues in which Kang defeats one of the male students. Pei Er insists he fight with her, but Kang only agrees to fight without weapons (to avoid accidentally harming the master's daughter). He beats Pei Er, throwing her to the ground. In a rage she slices off his arm and he flees toward a nearby village where he collapses over a bridge into a passing boat driven by a peasant girl named Xiao Man. Xiao Man nurses Kang back to health and the two grow fond of one another. She encourages Kang as he learns to fish with one arm, and tries to discourage any interest in him resuming martial training. When a couple of thugs, who it later turns out are disciples of Smiling Tiger, happen upon the couple, they humiliate Kang by giving him a vicious beating and nearly incapacitating his other arm. He sinks into a depression and Xiao Man tries to help by giving him a manual once possessed by her father. She reveals that her father died trying to protect it, and asked her mother to keep it for him as he died. It was partially burnt by Xiao Man's mother, who then decided against destroying it, and now only contains techniques for left-handed swordplay. Using the manual, Kang masters a new style that allows him to fight with only one arm. It also requires use of a smaller blade (because the left hand techniques are all meant to be off-hand). So he uses his father's broken sword, which just happens to be the right size. 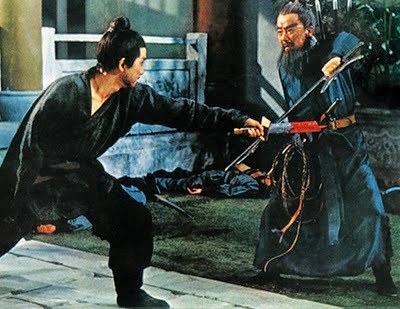 As Kang improves his martial arts, the conflict between Long-armed Devil and Qi Rufeng intensifies. The former has invented a weapon designed specifically to counter Rufeng's golden swords. It uses a locking mechanism to trap the weapons, enabling the user to pin the swordsman and finish him off with an off-handed dagger. He gives this instrument to Smiling Tiger and the two begin murdering Rufeng's disciples. They also kidnap Pei Er, who is rescued by Kang. The war between the masters escalates, and Long-armed Devil plans his final attack on Rufeng's 55th birthday, where the master intends to announce his successor in the presence of all his disciples. It culminates in an epic battle at the Golden Sword school with Kang showing up at the last minute to defeat Long-armed Devil using his new techniques and his father's half sword. I love The One-Armed Swordsman for a variety of reasons. The sets and filming all work to capture a tightly contained world of martial heroes. It almost feels cozy and like it has half a foot on the stage (it is very easy to see how much of this was likely inspired by theater). Most importantly I like the film because the protagonist is maimed, and I think this has appeal to anyone who has every felt disadvantaged or handicapped by circumstances. Even before he loses his arm, it is clear that Fang Kang is looked down upon by his fellow students due to his low birth. And why this works is it captures the essence of the martial arts for me. Fang Kang begins with the worst possible handicap for a swordsman, a lost arm. And not just any arm, but his right arm. But through hard work and perseverance he adapts, developing a new style that outwits his school's enemies. He takes what little he has and turns it into something potent. This is also a wuxia movie that emphasizes the problems inherent to the martial world (I hope to feature a couple of other movies that deal with this theme soon). It is about the cycle of grudges and violence that plagues martial families for generations. The film opens with a murder (Kang's father) caused by a grudge, and ends with a battle caused by a grudge. Xiao Man is the voice of reason in this world and that is probably one of the reasons Kang is drawn to her. Because of her experience with her father, she wants Kang to retire from the martial world to live as a farmer with her. A lot of the little touches in The One-Armed Swordsman also contribute to my enjoyment. I like how all the smaller pieces fit together so nicely in the end (his father's sword and his off-handed technique circumventing Long Armed Devil's sword locking mechanism for example). I didn't give it as much coverage as it deserved, but the love story between Kang and Xiao Man is very important in the movie, and I think handled well. It also provides most of the tension for Kang, because he is torn between wanting to protect his master and wanting to leave the martial world to be with Xaio Man. It is effective and handled in a way that is believable. This is an absolute classic and it genuinely stands the test of time. If you get an opportunity to watch it, definitely do so. Thankfully it is also a film that has been well preserved. It should be easy to find a copy with excellent quality audio and video. For gamers there is a lot here to inspire. More in the realm of NPCs and institutions I think. I once used The One-Armed Swordsman as the basis for a small mystery in my Oriental Adventures campaign and it worked very well. I tweaked it considerably of course, and I think most GMs can take some of the basic elements like I did, fleshing them out into something much more substantial.